In order to bring the ancient wisdom to the Western world, which had lost it, the initial effort was made with those who had some conception that invisible worlds and intelligences exist behind the veil of the seeming, i.e., the spiritualists. They were challenged on their own ground to broaden their outlook. Isis Unveiled, H. P. Blavatsky's first book, while not neglecting the consideration and criticism of materialistic science and dogmatic theology, gave special attention to the hidden side of nature, and to the control of occult forces by trained Adepts. In this way the idea that man is far greater than he seems was suggested to the unprepared audience of the seventies. Occult phenomena, including those of the seance room as well as what is commonly called magic, were removed from the domain of the supernatural and shown to be subject to scientific laws known to a few highly evolved human beings — Adepts. Isis also contained a sketchy outline of the teachings of cosmic and human evolution. These were further developed in succeeding years and still more fully explained in The Secret Doctrine. Isis Unveiled was begun almost simultaneously with the birth of the Theosophical Society, and it was published in 1877. It provided the only 'textbook' of theosophy available for several years; but it was far from being a complete outline of the philosophy, for the more definite teachings were reserved until students were better prepared to understand them. Described as "A Master-Key to the Mysteries of Ancient and Modern Science and Theology," it quickly became a classic in occult literature, though it only turned the key a little way. Two large editions of this really "epoch-making" work were sold immediately, and new editions have been appearing ever since. Her sympathy for the suffering prompted H.P.B. to send the first payments to Russia in aid of the relief work during the Russo-Turkish war then raging. Isis was a phenomenon in itself, for the author was not equipped with the technical scholarship or the literary training apparently indispensable for such a task, and with the exception of the learned Dr. Alexander Wilder, who tendered her valuable service, her few helpers were not qualified to give her the editorial assistance she most needed. H.P.B. disregarded all recognized literary canons, of which she knew nothing, and the book contains palpable errors of the printer and a few other slips which could not be corrected later because it was electrotyped. Although she could read and understand English when she landed in New York, she had almost forgotten how to speak it. She says that when she started to write a work which gradually developed into a two-volume book of 1,320 pages, she had "no more idea than the man in the moon what would become of it." She had, however, the inestimable advantage of having the direct inspiration of the Mahatmas, who were making their first effort to "break the molds of mind" in preparation for the bold undertaking: to build "a new continent of thought," and "to invite the elect of mankind to co-operate . . . and help in his turn enlighten superstitious man" (Mahatma Letters, 51). Isis Unveiled was a preparatory sketch, fragmentary by the deliberate intention of its inspirers, yet nearly all the subsequent teachings can be found in its pages, more or less plainly expressed or suggested. The method adopted was that of genuine Mystery schools which develop the intuition of the disciples in the early stages by merely giving hints or seemingly disconnected facts. The Secret Doctrine, her most important work, which appeared eleven years later, filled many of the gaps, but it also left much to be elucidated by the intuition of the reader. "Isis" was not unveiled but rents sufficiently large were made to afford flitting glances to be completed by the student's own intuition. In this curry of quotations from various philosophic and esoteric truths purposely veiled, behold our doctrine, which is now [1881, four years later] being partially taught to Europeans for the first time. It is an error to think that H.P.B. denied the principle of reincarnation in Isis, as some have said. She denied the misleading view of it held by the Allan Kardec school of spiritualism, then popular in France, which claimed that the human personality regularly and quickly returned to earth-life. She touched lightly on the subject, as it seemed to be too soon for the full exposition of it in view of the unpreparedness of the Western mind, which in general regarded reincarnation as "heathen foolishness." In order to understand the process of reincarnation properly a study of the complex nature of man is necessary — of the seven (or four) aspects of his nature, according to the subdivisions given in Indian psychology — the so-called seven principles of man. As the Masters found it was almost impossible for the audience H. P. Blavatsky was then addressing to understand even three principles — "body, soul or astral monad, and the immortal spirit" — the full exposition of reincarnation was postponed until a few years later, when it was more easily assimilated. This is explained by the Master K.H. in one of his letters to A. P. Sinnett (page 289). Today, after years of continuous work by the Society, it has become widely accepted in the West, even by many spiritualists. Periodical reincarnation of the higher ego on earth is only one example of the universal law of rhythm or periodicity — the "habit of Nature," reimbodiment. The teaching, even in its most occult form, could hardly be more plainly suggested without going into the detailed exposition that was deliberately avoided as being premature. H. P. Blavatsky said she suffered intensely for years from the errors that crept into Isis Unveiled, unwittingly by her, and too late to be remedied. One specially unfortunate mistake has caused much controversy, and as her opponents seized the opportunity to charge her with denying reincarnation in the New York days, it is necessary finally to clear up this point by presenting a conclusive point in rebuttal which could not be brought forward till lately. The 'difficult' passages usually cited against her occur in the first volume of Isis. On page 346 this sentence is found: "This is what the Hindu dreads above all things — transmigration and reincarnation; only on other and inferior planets, never on this one." And on page 347: ". . . this former life believed in by the Buddhists, is not a life on this planet, for, more than any other people, the Buddhistical philosopher appreciated the great doctrine of cycles." H.P.B. deals with these passages in Lucifer, III, 527-8, February 1889, and in Lucifer, VIII, May 1891 ("My Books"), as well as in The Path, November 1886 ("Theories about Reincarnation and Spirits"). In regard to the first sentence, she points out that she had written on the same page: "Thus, like the revolutions of a wheel, there is a regular succession of death and birth, the moral cause of which is the cleaving to existing objects . . ." and that without some rational explanation the whole thing "reads like the raving of a lunatic, and a jumble of contradictory statements" (Lucifer, III, 528). 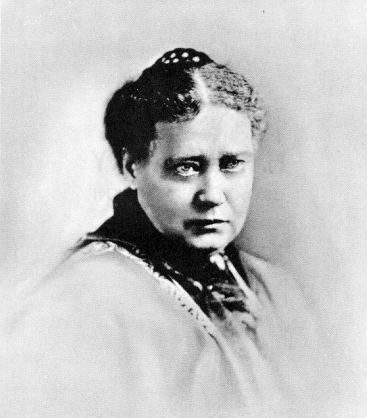 Now, H. P. Blavatsky was no lunatic, and as in several places in Isis she definitely teaches reincarnation, the explanation obviously lies in her statement that this confusion (and other obscurities) was caused by faulty proofreading by well-meaning persons on whom she had to depend, owing to her imperfect knowledge of English, and who were entirely ignorant of the problems in question. Not wishing to give offense, she guardedly says the trouble was largely due to the fact that "one of the literary editors" was "ignorant of Buddhism and Hinduism." Today, however, it has been revealed why H.P.B. had to suffer vilification in this matter, especially for the statements quoted above from pages 346-7. According to a footnote in the Mahatma Letters, page 77, by the Master K.H., the "literary editor" responsible for the errors (innocently, of course) was Colonel Olcott: "By-the-bye, I'll re-write for you pages 345 to 357, Vol. I., of Isis — much jumbled, and confused by Olcott, who thought he was improving it!" These are the very pages on which the enemies of H. P. Blavatsky have depended for their unfair attack. 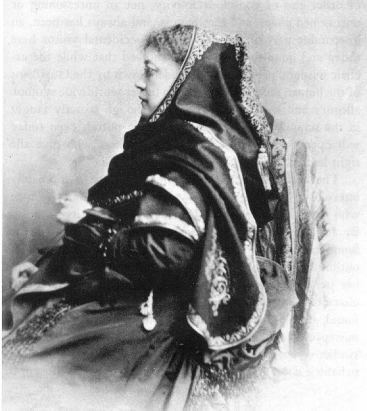 Link to Illustration: H. P. Blavatsky, 1875, Ithaca, N.Y. Colonel Olcott, in his semi-autobiographical work above quoted, and W. Q. Judge, in various magazine articles, describe her methods of work on Isis. She was constantly helped by telepathic dictation from the Masters K.H. and M., and also from other Adepts in the Orient. The various kinds of occult phenomena produced by her during the time she was being helped with Isis by Olcott and Judge were not intended to satisfy their curiosity, but to serve strictly practical purposes. To her, and even to them, they were not prodigies but natural events in her busy day's work. Isis Unveiled boldly challenged the theological, the scientific, and the spiritualistic worlds, and while H. P. Blavatsky knew that the two former would try to discredit her and her work, she hoped that the broader-minded spiritualists would welcome her exposition of the "Higher Spiritualism," the true science of man, which she brought from the archaic teachings of the mystic East. Unfortunately, the spiritualists in general did not respond to her efforts, and her lifelong martyrdom began (as she had foreseen and told W. Q. Judge), during which she was treated by the unthinking as some kind of criminal instead of the benefactor she really was. The prevailing belief among spiritualists when Isis was written (largely for their instruction) was that occult phenomena were produced only by disimbodied human spirits. Nothing was known about the complex nature of man or the existence of the astral body; soul and spirit were mere undefined words. The astral light, well known to the ancient philosophers, was ignored, the elementals or nature spirits were flatly denied and the very word occultism was declared by prominent spiritualists to be an invention of the theosophists. These and other concepts, although hoary with age, when presented by H.P.B. in Isis and elsewhere, aroused bitter opposition and even persecution, which were not diminished by her claim to be able to produce occult phenomena by her trained will, and not by passive mediumship. The trend of modern spiritualism suggests that it is approaching the true teaching of the ancient "Spiritualism of Alexandria, the Theodidaktoi, etc.," which H. P. Blavatsky offered the spiritualists in New York, only to have it rejected without proper study. Even reincarnation is no longer a bugbear. Spiritualistic journals and speakers give sympathetic attention to its possibilities, and many of their best minds are putting forward the theosophical arguments for it. When Isis Unveiled proved such a brilliant success, the publisher offered H.P.B. $5,000 for a one-volume continuation in which still more should be 'unveiled,' and which would be sold for $100 per copy. Poor as she was, she refused, saying it was not permissible to give out any further teachings at that time. Olcott says that enough additional MSS. to make a third volume had actually been written, but they were destroyed before she left America. Throughout her whole career she never let pecuniary advantages swerve her from the strict lines of conduct inculcated in the esoteric schools in regard to the presentation of occult information. The Dweller is watching closely and will never lose his opportunity, if our Sister's courage fails. This is to be one of her hardest trials . . . how dangerous for her will be the achievement of her duty and how likely to expect for both of you [Olcott and Gerry Brown] to lose a sister and a — Providence on earth. . . .
She must encounter once more and face to face the dreaded one she thought she would behold no more. She must either conquer — or die . . . solitary, unprotected but still dauntless she will have to face all the great perils, and unknown mysterious dangers she must encounter . . . Brother mine, I can do naught for our poor Sister. She has placed herself under the stern law of the Lodge and these laws can be softened for none. As an Ellorian she must win her right . . . — Letters from the Masters of the Wisdom, II, 42 et seq. She succeeded in her inner battle and, as can be seen in the Blavatsky Letters, page 187, she could boldly defy the dreaded "Dweller on the Threshold" more than ten years afterward, though others — unprepared by self-discipline, such as Babaji — were not so fortunate. From all this it is seen that she not only challenged the opposition of the representatives of materialistic science and of traditional ecclesiasticism, but also the most powerful and malignant intelligent forces on the invisible planes of being. The average man is totally ignorant of these forces, which are extremely dangerous to all who are not perfectly pure in heart and impersonal. A few mystics, such as the earnest seeker, Stainton Moses, appear to have encountered them, and to have suffered thereby. A reference is made in the Mahatma Letters (p. 42) to his trying experience, and to H.P.B. 's desperate attempts to rescue him. While living in Philadelphia, to Olcott's astonishment, she decided to marry M. C. Betanelly, a man who was not her equal in mentality or station in life. She was forty-three years old and the marriage was contracted on unusual terms. The suitor professed the greatest admiration and respect for her, and she finally agreed to his offer on the understanding that the marriage was to be purely nominal, and merely one of friendly companionship and complete independence on her part. She even retained her name Blavatsky. But the alliance lasted a very short time, for the husband, if he can be so called, soon repented of his contract and became a passionate lover. As she rejected his overtures with horror, the "phantom marriage," as it was called, was in 1878 dissolved in court, Mr. Judge being her counsel. Colonel Olcott said she told him that the affair was the effect of karmic complications in past lives, and that, while it seemed very unfortunate and strange, it was a necessary experience as a final corrective for certain temperamental weaknesses which troubled her real Self. This was only one of several remarkable and sudden restorations to health when physicians declared her condition critical. She attributed them to the direct intervention of her Master because she was needed to continue her work. Unfortunately, she neglected to rest her limb, as instructed by the Master, and in consequence she was not really well for several months. In 1876, considerable attention was focused on the Theosophical Society by the cremation of a certain Baron de Palm, to whom Colonel Olcott had been very kind during his last illness. This was the first public cremation in America in a crematorium. In the two previous cases, open-air funeral pyres were prepared. Colonel Olcott arranged and conducted a funeral service in the New York Masonic Temple which was attended by an enormous crowd, mostly curiosity-seekers not sympathetic with theosophy or cremation. What promised to be a serious disturbance was avoided by Colonel Olcott's tactful handling of the situation, and the impressive ceremony gave the audience a new conception of the theosophical interpretation of death. Intense opposition had been displayed against cremation, but the successful disposal of the body of de Palm greatly helped in breaking down the ignorant prejudice against this sanitary and reverent disposition of the worn-out vehicle of the soul. The baron bequeathed his supposedly valuable property to Colonel Olcott, who arranged to hand it over to the Society. But when the will was probated and inquiries were made about the property, it appeared that it would not even cover the cost of probate and funeral! De Palm was a ne'er-do-well Bavarian baron with a past. He had no means, but plenty of debts. He had no literary interests or scholarship, and he displayed only a purely superficial fancy for psychical phenomena. It is necessary to mention these unfortunate matters because unscrupulous persons, especially the French Kabbalist Encausse (Papus), have spread the calumny that Isis was "a compilation from the manuscripts of Baron de Palm, and without acknowledgment." In his Old Diary Leaves, Colonel Olcott gives documented particulars of de Palm's career, legally certified. This slander presents a typical illustration of the depth of mendacity to which apparently decent human beings can descend when they are determined to besmirch the character of H. P. Blavatsky. It is significant that the baser side of human nature is instinctively aroused to opposition whenever it comes within the radius of the revealing light of Truth. The publication of Isis Unveiled brought immense correspondence, and branches of the Society began to be thought of, a group of students in London being the first officially to form themselves into an organized branch of the T.S. Another group, who seem to have had a deeper understanding of theosophy than many of the original London members, existed in Liverpool from an early date but saw no reason to organize into an official lodge until much later. The Liverpool Lodge became a strong center of theosophy. Another group, in Corfu, Greece, also delayed organizing until after the London members formed the first chartered T.S. branch, "The British Theosophical Society," in June 1878. In the circular of the London Society the primary importance of brotherhood is plainly stated. After enumerating some of the objects of its existence, which include self-study and self-development, it concludes: "and chiefly to aid in the institution of a Brotherhood of Humanity." Early in 1878 an alliance was made between the Theosophical Society and the Arya Samaj, an Indian reform movement established by Swami Dayanand Saraswati, a learned pandit and a famous yogi, at that time having genuine occult relations with representatives of the Great Lodge, and "endowed some years back with great powers and a knowledge he has since forfeited, . . . this truly great man, whom we all knew and placed our hopes in," as K.H. said in 1882 (Mahatma Letters, 309). The aims and methods of the two societies seemed almost identical, and the name of the T.S. was even changed for a while to "The Theosophical Society of the Arya Samaj." Unfortunately, Dayanand's views proved narrower than was at first apparent, and his Samaj turned out to be little more than a reformed Hindu sect. Dayanand protested bitterly against the friendly attitude of the theosophists toward Buddhism, Zoroastrianism, and other faiths, "false religions," as he called them. Finally, in 1882, following a period of troubled relationship which culminated after the theosophical headquarters was established in India, the working alliance was severed and each society went its own way. It is impossible for the Theosophical Society to be identified in any way with any kind of sectarian organization or belief, even the most progressive, for that would destroy its neutrality and its strictly nondogmatic character, which is essential in the effort to establish a universal brotherhood. The seeds of theosophy having been planted in the West, orders came from the Masters in 1878 to begin work in the Orient, and H. P. Blavatsky prepared to leave for India; this time, however, not as an unknown traveler but as the writer of a widely read book and the chief representative of what was becoming known as a new development in thought and action. Colonel Olcott was directed to accompany her, and he quickly wound up his business and personal affairs to devote his life to theosophy in strange lands where the future was veiled in darkness and mystery. This successful, American, matter-of-fact man of affairs must have had a magnificent trust in H. P. Blavatsky's mission and in the support of the Masters, for, although he obtained high testimonials and a special passport from the United States government, and received a commission to report to the government on the commercial conditions in the East, no definite business opportunity was awaiting him. He was sacrificing all that ordinary men hold dear. The prospect, however, was not altogether a surprise to him, because some years before he had been prepared by the Master M. for a drastic change. Late one night, in New York, after he and H.P.B. had ended their day's work on Isis, he was sitting alone in his own room with the door locked, when to his great surprise the Master M. appeared suddenly and conversed with him, offering him the opportunity of taking part in a great work for humanity, and telling him of the mysterious tie between H.P.B. and himself (Olcott), which could never be broken though it might be greatly strained. The Master disappeared as strangely as he had arrived, leaving his turban as a proof of the reality of the interview. Colonel Olcott was greatly impressed by this experience, and many years after he declared that it had helped him to stand firm and unshaken during many serious crises. He describes it in detail in Old Diary Leaves.